Dr. Paul De Luca received his B.Sc in Biology in 1995 and M.Sc in Zoology in 1997 from the University of Toronto. In 2000 he joined the College of The Bahamas as a Lecturer in Biology. Upon completion of his contract in 2002 he began his Ph.D. at the University of Missouri. He obtained his Ph.D. in 2007 studying insect communication and then returned to the University of Toronto as a Post Doctoral Fellow in 2009. In 2011 he returned to COB as an Assistant Professor and completed another two year contract before relocating to Ithaca, NY in 2013 where he worked as a Lecturer at Ithaca College. In 2016 he returned to Nassau where he is currently an Assistant Professor of Biology at the University of The Bahamas. In 2013 while conducting an insect biodiversity survey at the Leon Levy Native Plant Preserve on Eleuthera Dr. De Luca collected several specimens of a katydid that he could not identify. After showing pictures of the insect to another colleague it was determined that these specimens were in fact an unsubscribed species. In 2014 more specimens were collected and examined by Dr. Glenn K. Morris, a katydid taxonomist and specialist in New World Tettigoniidae. The specimens were identified as being extremely close to Erechthis gundlachi, a katydid known only from Cuba and Hispaniola. The new species was named E. levyi, in honor of Leon Levy, after whom the Preserve is named. Future research will involve mapping the full distribution of E. levyi throughout The Bahamas, in order reconstruct ancestral patterns of movement and dispersal of this genus throughout the Greater Antilles. 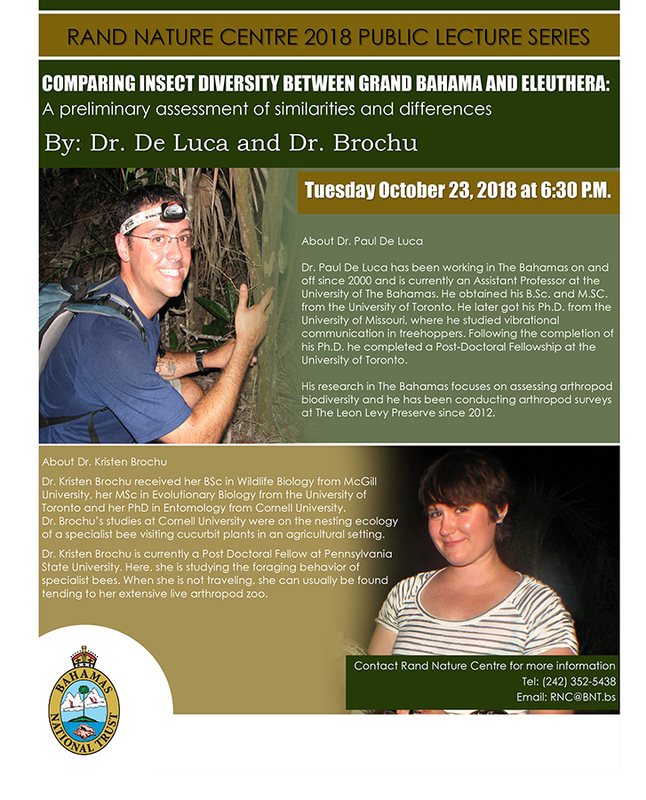 Kristen received her BSc in Wildlife Biology from McGill University, her MSc in Evolutionary Biology from the University of Toronto, and her PhD in Entomology from Cornell University where she studied the nesting ecology of a specialist bee visiting cucurbit plants in an agricultural setting. She is currently a Post Doctoral Fellow at Pennsylvania State University where she is studying the foraging behaviour of specialist bees. When not traveling, she can usually be found tending to her extensive live arthropod zoo.